Once an executive or senior development officer makes a commitment to sales this is the question that’s often asked. Recently, we interviewed For Impact alumni and past clients who have demonstrated great success with the For Impact (Sales) approach. 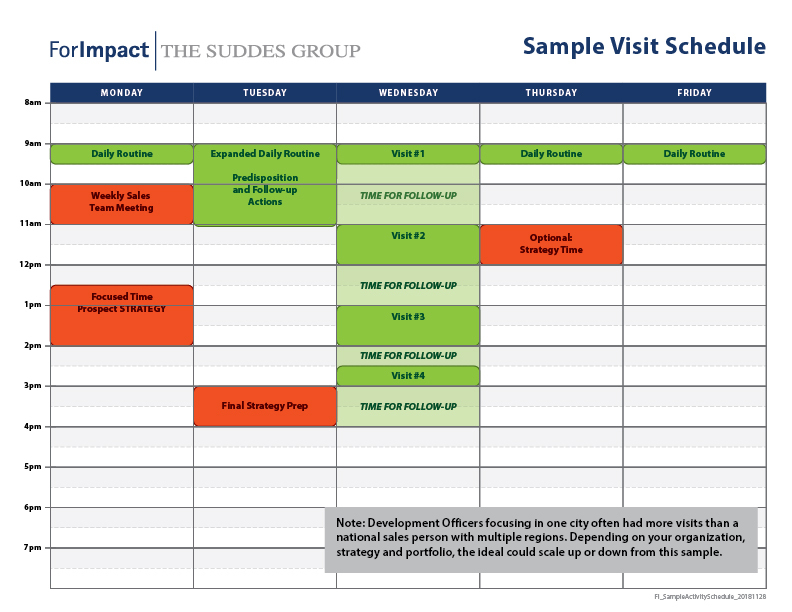 This sample visit schedule is a composite of several calendars we studied. It demonstrates the PRACTICAL routine and focus for a true salesperson. Green and Red Time. Green represents time inside the sales process doing the activity related to predisposition, making visits and follow-up. Red time is planning, prep and strategy time. Use the calendar to manage activity.EVERY successful salesperson we interviewed used their calendar to manage activity. They scheduled routines and blocked out time (sometimes months in advance) to think and prepare. Focus and Routine. I’m often asked how much time sales should take. That’s a difficult question because it doesn’t take much time at all. (In fact, this calendar only blocks out 20% of the time!) Instead, it takes two things: Focus and Routine. On the IDEAL calendar, visits are focused on one day of the week. The ideal week rarely happens but the best salespeople know how to FOCUS their time.The other highlight is a daily routine to answer emails, adjust calendar and priorities.For more on focus and routine read: Batching, Flow and Focus. A big, important WOW – actually block out time for strategy! We rarely schedule time to THINK but it pays off, big time. 11 months out of the year. This would be 132 visits per year! To be effective at fundraising — to generate RESULTS — you do not need a lot of TIME, but you need the ability to FOCUS your time. Again calling upon Drucker’s wisdom, he observes that effective executives “consolidate their ‘discretionary’ time into the largest possible continuing units.” They BLOCK their time around a task. Scenario A: Executive devotes 20% of her week to fundraising activities. Scenario B: Executive sets aside two 4-hour blocks in her schedule to focus on fundraising activities. Scenario B will be more effective every time. “The problem… is that when you switch from some Task A to another Task B, your attention doesn’t immediately follow—a residue of your attention remains stuck thinking about the original task.” This creates Attention Residue. AND it turns out task-switching requires enormous energy! We have to redirect millions of circuits in our brain — in effect — loading a new activity into our conscious mind. That takes real mental energy, and we can only do this so many times in a day until we are faced with task-switching fatigue. We should also think about how we block time to focus. It’s not reasonable to carve out large chunks of time for each task. However, we can carve out time for similar types of mental activities, which is called ‘batching.’ Here’s a great story about Wharton professor and author Adam Grant (also from Deep Work). Though Grant’s productivity depends on many factors, there’s one idea in particular that seems central to his method: the batching of hard but important intellectual work into long, uninterrupted stretches. Grant performs this batching at multiple levels. Within the year, he stacks his teaching into the fall semester, during which he can turn all of his attention to teaching well and being available to his students. 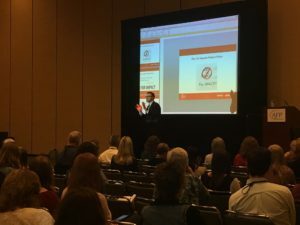 (This method seems to work, as Grant is currently the highest-rated teacher at Wharton and the winner of multiple teaching awards.) By batching his teaching in the fall, Grant can then turn his attention fully to research in the spring and summer, and tackle this work with less distraction. Grant also batches his attention on a small time scale. Within a semester dedicated to research, he alternates between periods where his door is open to students and colleagues, and periods where he isolates himself to focus completely and without distraction on a single research task. (He typically divides the writing of a scholarly paper into three discrete tasks: analyzing the data, writing a full draft, and editing the draft into something publishable.) During these periods, which can last up to three or four days, he’ll often put an out-of-office auto-responder on his e-mail so correspondents will know not to expect a response. “It sometimes confuses my colleagues,” he told me. “They say, ‘You’re not out of office, I see you in your office right now!’” But to Grant, it’s important to enforce strict isolation until he completes the task at hand. My guess is that Adam Grant doesn’t work substantially more hours than the average professor at an elite research institution (generally speaking, this is a group prone to workaholism), but he still manages to produce more than just about anyone else in his field. I argue that his approach to batching helps explain this distinction. In particular, by consolidating his work into intense and uninterrupted pulses, he’s leveraging the following law of productivity: High-Quality Work Produced = (Time Spent) x (Intensity of Focus). If you believe this formula, then Grant’s habits make sense: By maximizing his intensity when he works, he maximizes the results he produces per unit of time spent working. Monday / Tuesday: Focus on visits. Wednesday: Focus on follow-up and next week’s predisposition. Thursday/Friday: Batch together (if possible) administrative duties. 2:00 – 5:00 Scheduled time to follow-up with prospects. Or, if you’re both a manager and someone in charge of fundraising you might consider the Maker’s Schedule / Manager’s Schedule. Many readers are familiar with mental state called ‘FLOW.’ It was termed by University of Chicago psychologist Mihaly Csikszentmihalyi in 1990. Most people think ‘FLOW’ is about productivity, but that’s actually not the point. FLOW is first and foremost about personal fulfillment and satisfaction. We are MOST fulfilled when we’re immersed (read: FOCUSED) in something that is deeply challenging. This ‘state’ is what is termed flow state. From the archives – This is a piece our founder, Tom Suddes, wrote in 2010. I’ve found myself using the EAP framework a lot these past few weeks. Thought it would be a great time to share with our readership. Here’s a very simple way to get stuff done: Make EVERYTHING A PROJECT! This simple concept, guiding principle if you will, is for anybody who is trying to achieve a goal, make a quantum leap or change the world. This idea has been developed over the last 10 or 15 years within our company and with our clients. It drives everything we do. Team Leader. Obviously, critical decision. This pick needs to underscore the idea of ‘WHO’ not ‘HOW’! The right Team Leader will do whatever it takes to reach the project’s goals. They will be collaborative coaches… but also be able to make decisions. Paraphrasing Bill Gates, the strategy for a given project must be in one person’s head. Project Team. This is all about TALENT. Diverse. Eclectic. Focused on strengths. Clear roles. Goals. Clear. Concise. Compelling. Must define ‘success’. Believable. Achievable. Always better if big, hairy and audacious. *Goal should translate into a Self-Fulfilling Prophecy. Resources. People. Money. Tools. Support. Internal and External. Need vs. Want. Barriers/Constraints. Direct tie to Resources. Scope. Budget. Size. Simplicity. ‘White Space’. Rule of 3. *ANYBODY can do just about ANYTHING with an UNLIMITED BUDGET and NO TIME LIMIT! Constraints are what makes this a project. Time Table. Not just a CONSTRAINT, but a way to set benchmarks, control flow, create AFE’s (Action Forcing Events). Measurement. Again, Benchmarks. Sub-Goals. Critical Path. Accountability. Evaluation. Opportunities. And more. Hollywood. These projects can be like a Hollywood movie. You bring together the most talented people you can, without regard to the department or org chart. Everyone comes together for a movie project and take it from concept to finished film. Then they disband and start again. Scope of a PROJECT. Can range from a $300M Campaign to a 1-Night Signature Event… and everything in between. The 3 Circles/3 Buckets are PROJECTS, as well as the Programs and Priorities within each. Every one of our TOP INVESTORS is a PROJECT… demanding a strategy, action plan, etc. Rather, gather team together whenever needed for brainstorming, mind mapping, engagement, whatever. Disseminate information before the gathering. Quick review of goals and status. Steve Jobs always challenged WHO attended and WHY people were in a meeting. 3 Parts to a Project. Through the first half of the twentieth century, experts thought it was impossible for a human to run a mile in under four minutes. Then, on a rainy day, in 1954, a skinny medical student from Oxford named Roger Bannister became the first person to run a sub-four-minute-mile. He electrified the world when he ran 5,280 feet in 3:59.4. Sir Roger Bannister passed away this weekend at the age of 88. Bannister showed others what was possible. In the decade that followed Bannister's run, five more runners achieved a 4 minute mile. And in the next decade… now knowing that the human body was capable of a four-minute mile.. 300 hundred runners would go on to break this time barrier. This first-of-a-kind achievement, followed by many others that replicated became known as The Roger Bannister Effect. Think about The Bannister Effect in the world of social innovation, philanthropy, and impact! What limiting stories do we tell ourselves? What is possible if we ignore those stories? What if we are the FIRST to show others what’s possible? Observe — in your community — how a civic leader makes a $1M gift. Suddenly, everyone is emboldened to ask that person for $1M. Don’t make decisions for your prospects!! Many DECIDE something can’t be achieved. But we only decided that on the basis that it has never been done before. Use the Rogister Bannister metaphor! Think about your work. Perhaps you strive to achieve a Roger Bannister Effect for social innovation. What if we could show others what was possible? With changing, saving, or impacting lives? 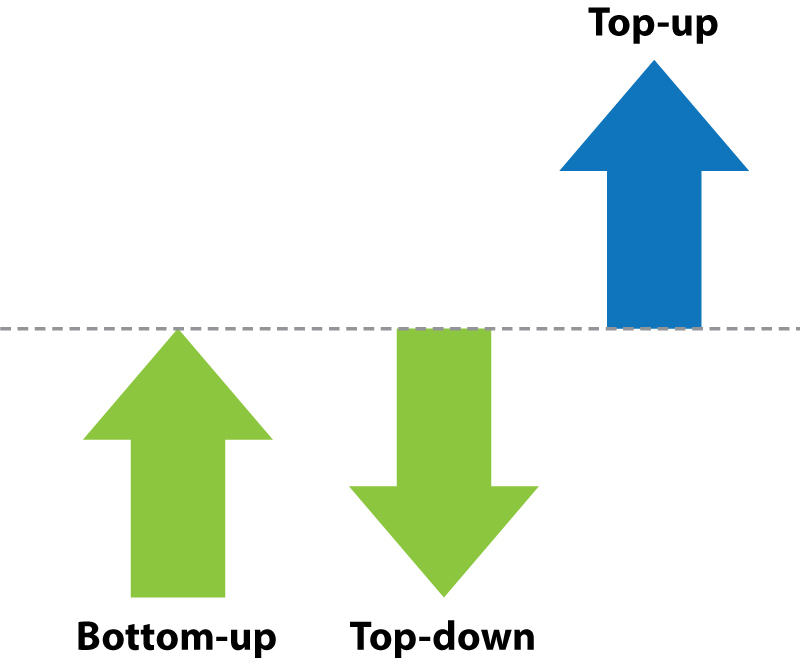 You’ve probably heard of these traditional sales strategies: ‘top-down’ and ‘bottom-up’. But here’s a different way to think about strategy with foundations, specifically – What if you sold TOP-UP? Top-down selling focuses on the CEO, or leadership. Getting them on board with your cause or case. Bottom-up would focus on the rest of the foundation/organization. By way of example, this might mean analysts, or program directors. Top-up selling is when you help the funder develop strategy, effecting greater impact, alignment and (often times) income. The definition of impact is ever changing…. This is where we (again) invoke the For Impact Point of View: Impact drives Income. Instead of trying to think about how to get grant, think instead about trying to offer your expertise… assistance… perspective to help the foundation to clarify strategy and have impact. This changes the approach. It may or may not result in funds to your cause but it should result in more impact for society AND a much stronger relationship when it comes to funding. Several years ago we were working with a Senior Center. The organizational leadership had a combined 74 years of experience working in the sector and the Executive Director was a published author on the subject of ‘Aging in Place’. A new foundation had just been established to fund ‘aging in place’ and the benefactors had hired their own Executive Director to create a strategy and run the foundation. The Senior Center applied for a grant and been rejected. If we’re thinking about the INCOME, then this stings a little bit and it is what it is. If we’re thinking about the IMPACT it reframes the potential for the relationship. Long story short, it was a great approach. The foundation had a greater impact. AND, the ED of the Senior Center was introduced to the foundation benefactors directly. They became some of the largest financial supporters of the foundation AND lead funders to the Senior Center’s subsequent Capital Campaign. The Suddes Group / For Impact invests profits back into the social sector with a focus on to developing talent and leadership for the (social) impact. We’re really proud of Unreasonable Institute, which has been a great partner through which to focus this investment. In addition to supporting the Unreasonable Institute through strategy and fundraising, we provide a curriculum, coaching and training for entrepreneurs that go through the Institute programs (now in 30+ countries)! We’re beaming with pride yet again as Teju, Banks, and the entire Unreasonable Team have made a strategic leap to have more impact. Through this leap, they’ve also rebranded. The Unreasonable Institute is now UNCHARTED: Charting the Course from Impossible to Possible. Here is a little from the Uncharted team about their evolving course and story. With an entrepreneur-centric model (Unreasonable Institute), we worked with a wide diversity of entrepreneurs who were creating impact in different sectors. In one cohort, we had entrepreneurs working in healthcare, education, and renewable energy. There was valuable impact with this model, but we want more than that. We want to accelerate the people and organizations that are uniquely positioned to tackle the same issue and put a big dent in it. So we’re moving from an entrepreneur-centric model to a problem-centric model where we put the problem at the center—like how to get low-income students into college. With that as our organizing principle, we identify the best people and organizations to put a dent in it and accelerate them so we can see measurable change. Entrepreneurs are only one catalyst to put a dent in big problems. The entrepreneurs we have worked with over the last seven years have created extraordinary impact, but to move the needle on a problem requires engaging a larger audience of entrepreneurs, corporations, policy-makers and governments. We asked: What if we could build a collective movement around a problem? Through a collective approach, we can address multiple drivers of one single problem. We’re going to take on specific problems, and build an army of entrepreneurs and give them access to what they need—mentors, funders, and partners— to attack it from all sides. That way, when we attempt to solve a problem, the odds of solving that problem go up dramatically. There is no single way to solve the problems our globe faces. This learning marked the beginning of an arduous, important journey to not only a new look, but also a redesigned approach for how to solve the world’s greatest problems. Uncharted represents that our world, and how we improve it, is not fixed. There is no single way to solve the problems our globe faces, so we must head into the uncharted and learn what it takes to put big dents in big challenges our world encounters. Problems are complex and dynamic. Our approach to solving is multi-colored, multi-changing, and multi-shaped. Uncharted will adapt and become best suited to solve. This is a simple concept I’ve used a lot the coaching of others. I often watch people in an interview, or a sales call, ramble on in response to a question. In many cases, it’s as though they’re doing the thinking WHILE they’re talking.. and the model I have in my head is that of exploding fireworks. They start talking about one thing, the FIND a point and then explode into a new direction around that point… and then another direction… and so on. Think instead about the mental image of throwing a dart to answer the question. Stop. Think about what point you want to make. Throw the dart. Then stop talking. The same is true of organizations. I read somewhere that the common element of the longest surviving companies in the world was not business model, sector, or size… it that they were great learning organizations. This is from a timeless Drucker article that appeared in HBR 2004, “What Makes an Effective Executive”. Kerry and I are spending time this week at the AFP’s International Fundraising Conference in San Francisco. If you’re here, come find us! We delivered a session this am: BE FOR IMPACT! It was great to share the point of view, napkins, some stories about Walt Disney and more!